Senate Republicans may try again to “repeal and replace” the Affordable Care Act (ACA) next week. The latest bill was introduced less than a week ago by Senators Lindsey Graham (R-SC), Bill Cassidy (R-LA), Dean Heller (R-NV), and Ron Johnson (R-WI)—known for short as the Graham-Cassidy bill. This 141-page bill includes a number of policies that differ from previous House and Senate Republican bills. Yet, surprisingly, the Graham-Cassidy bill exacerbates rather than addresses concerns that prevented previous Senate bills from passing in July. Here’s how. 1. Worst bill on increasing health insurance premiums. The debate over repealing the ACA is partly driven by claims of high and rising premiums in the individual health insurance market. Yet, the Graham-Cassidy bill could drive up premiums and drive out insurers more than any other bill proposed thus far. Unlike previous Republican bills, the Graham-Cassidy bill would repeal the nationwide tax credits that keep premiums low, then replace them with lower and slower-growing state block grants from 2020 through 2026. Each state would determine the use of these funds which, starting in 2020, would not necessarily need to be spent on lowering Americans’ premiums. This would create a “black box” around this key source of financial support for the health insurance market. The block grant would be implemented alongside the Graham-Cassidy bill’s immediate repeal of the requirement that people who can afford coverage buy it (i.e., the individual mandate) and its refusal to fund cost-sharing reductions (another form of financial assistance for low-income Americans). The Congressional Budget Office (CBO) projected that the effects of these policies would drive up premiums by at least 20 percent in 2018 (Figure 1). In subsequent years, the uncertainty created by the Graham-Cassidy bill’s radical change in financial support could drive health insurance companies out of the market altogether. 2. Worst bill on increasing the number of uninsured. The Graham-Cassidy bill’s immediate repeal of the individual mandate, like previous Republican repeal-and-replace bills that CBO analyzed, would likely increase the number of uninsured Americans next year by 15 million. Unlike other bills, however, this one would fully repeal all new financial support offered by the ACA after 2026. Specifically, it would sunset the state block grants that replace the Medicaid expansion and premium tax credits. The loss of an estimated $299 billion in federal funding in 2027 would likely have the same impact on coverage as repealing the ACA with no replacement plan. CBO estimated that this would cause 32 million Americans to lose health insurance coverage in 2026. 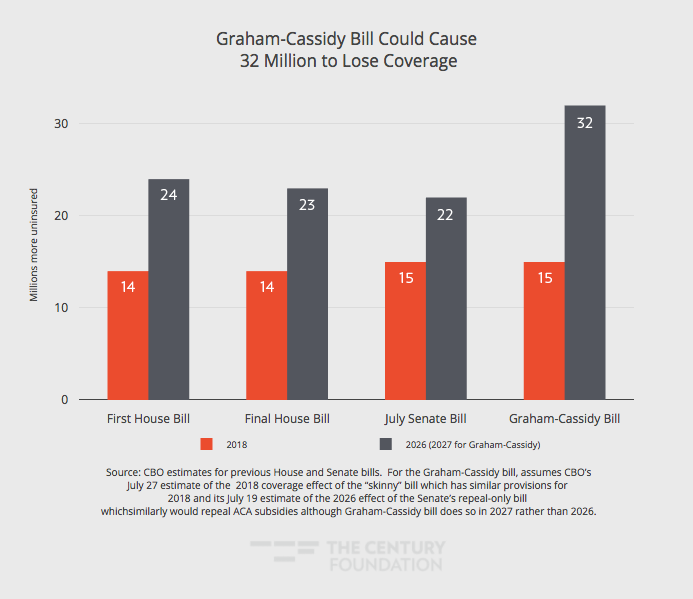 The coverage effect of the defunding that the Graham-Cassidy bill proposes enacting in 2027 would likely be higher than the CBO’s estimate, because the bill would permanently continue the Medicaid funding caps (Figure 2). 3. (Arguably the) worst bill on reducing patient protections. The Graham-Cassidy bill would disproportionately harm the health care system’s most disadvantaged consumers. The legislation ends Medicaid expansion and caps the existing program, putting vulnerable enrollees at risk of paying significantly more for care or losing coverage altogether. It excludes the (albeit insufficient) fixes, like the $45 billion fund for opioid addiction, that were included in the previous Senate bills. It includes an array of policies that would limit women’s access to care, including defunding Planned Parenthood clinics and undermining essential health benefits such as maternity care (Figure 3). It would allow states to let insurance companies set extremely high premiums for people with pre-existing conditions, returning to the days when being sick could mean being priced out of coverage. Finally, by scrapping the ACA’s premium tax credit structure, it would end the guarantee of affordable coverage for middle-income people who purchase coverage on their own, including veterans and the self-employed. These repeals of nationwide protections, alongside the bill’s other proposals, arguably makes Graham-Cassidy the weakest of all Republican bills for the people who most need health care. Note: This table assumes current levels of enrollment, although the Congressional Budget Office (CBO) estimated that the AHCA would reduce individual market enrollment by 6 million in 2018. 4. Worst bill on shifting costs to states. 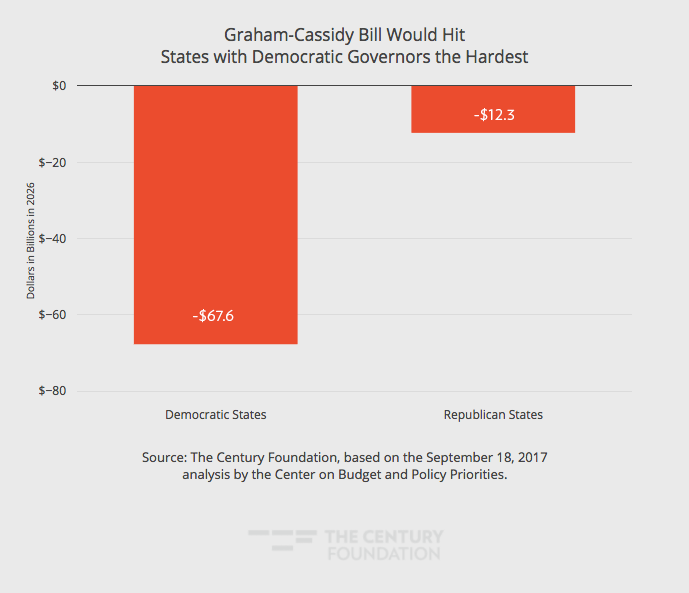 Fitch Ratings reported last week that the Graham-Cassidy bill’s provision may be “more disruptive for most states than prior Republican efforts.” This is because the bill would cap all federal Marketplace and Medicaid financing for health coverage, shifting the risk of rising and unexpected health costs to states. For example, the unplanned costs of a Zika epidemic, an economic downturn, natural disaster, or breakthrough drug would be borne by states without a commensurate increase in federal spending. As the Fitch Report concluded, this bill’s financing structure could force states to cut back on K-12 or higher-education funding to offset these costs. 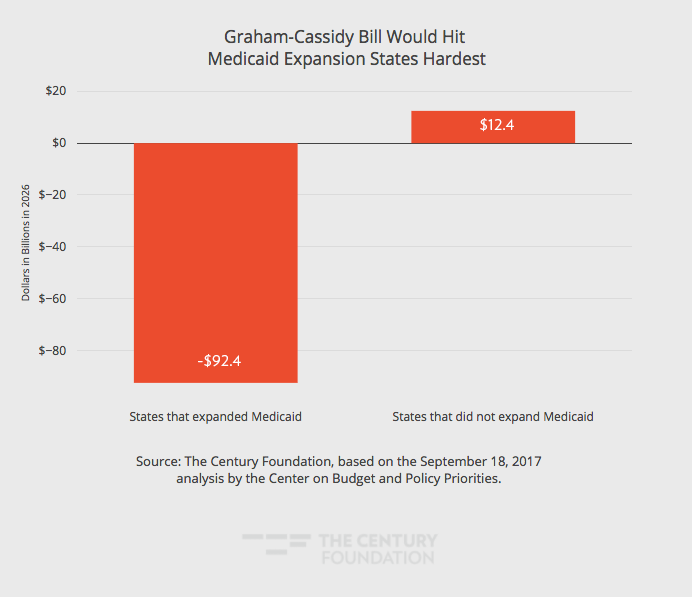 The legislation also would reallocate federal Medicaid funding, with the result being less funding for states that opted to expand Medicaid and more for those that didn’t, the latter of which have left an estimated 4.8 million people uninsured (Figure 4). Governors from across the political spectrum have objected to the Senate considering this bill, and more are likely to oppose this bill as they run their own numbers on its potential effects. 5. Worst process for rushing through a partisan bill. Lastly, should this bill come to a vote next week, Senators will be voting for the Graham-Cassidy bill with the least amount of information on any of the repeal-and-replace bills to date. CBO stated that it cannot produce more than a basic statement of the bill’s fiscal impact before September 30. As such, no official Congressional estimates will be available on annual budget costs and cuts, coverage and premium effects, impact on benefits and out-of-pocket costs for people, and health insurance market stability. Nor has the Graham-Cassidy bill been through the type of scrutiny many Senators sought in July, such as a regular committee review, an amendment process, expert engagement, and constituent town hall discussions. Nor is it bipartisan: the reason for the rush is to take advantage of the expiring rule that allows the Graham-Cassidy bill to pass without any Democratic votes. To top it all off, the bill may have only a few minutes of debate before a vote: the mandatory twenty hours of debate for this type of bill was conducted in July on a completely different version. Senators are not faced with the choice of the Graham-Cassidy bill or nothing. Since the partisan push stalled in July, Senators Lamar Alexander (R-LA) and Patty Murray (D-WA) held bipartisan hearings on policies to improve market stability. The bipartisan House Problem Solvers caucus put forth a white paper with consensus proposals. And bipartisan governors sent their shared priorities and recommendations to federal policy makers. The five ways that the Graham-Cassidy bill is worse than its predecessors suggests that it is time to give bipartisanship a chance. Authors’ calculation based on the 2010 percent of enrollees without specified benefits multiplied by the CPS 2015 number of non-elderly people enrolled in nongroup health plans. This is the same approach extended to maternity and drug coverage used by Richard G. Frank and Sherry A. Glied, “Flexibility on ‘essential health benefits’ will increase cost of insurance for pregnancy, addiction, and mental illness,” Stat, March 20, 2017. Note that some fraction of people in nongroup health plans are in grandfathered, transitional, or exempt health plans to which the essential benefit coverage requirement does not apply. These estimates do not include enrollees in small group health plans also subject to this requirement.